On October 3rd, 2018, at the end of two years of research and awareness-raising, PACT Foundation and MKBT: Make Better, in partnership with GAL Reșița, DEP Bumbeşti-Jiu Association and Valea Corbului Initiative Group, announced the successful completion of the first step towards the recognition and regulation of informal settlements in Romania: the introduction in parliamentary procedure of the bill for amending and completing the Law no. 350/6 July 2001 on Spatial Planning and Urbanism or the Law of Informal Settlements. The legislative process of the bill can be tracked on the webpage of the Senate of Romania. According to a survey conducted in the period 2013-2014, to which only 53% of the administrative units responded, there are 50,000 homes and about 64,000 families in Romania that are located in informal settlements, thus, over 200,000 citizens lacking permanent identity documents with zero or limited access to infrastructure and basic services, such as electricity or running water, education and health services. Romania is the only EU country that conditions identity (possession of definitive identity documents) on property (possession of property documents). Until now, the relevant Romanian legislation made no reference to informal settlements and did not allow the regulation of the situation of their inhabitants. In the absence of legal provisions, the phenomenon risks expanding, making further interventions more difficult. 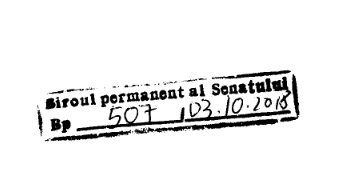 The legislative draft, submitted on October 3 to the Senate Registry, proposes a definition of informal settlements, establishes the necessary framework for integrated public intervention for regulation, limiting the extension of informal settlements and improving the living and safety conditions of their inhabitants and clarifies the responsibilities of public authorities in coordinating activities of identification, regulation, monitoring and evaluation of informal settlements in Romania. The project was submitted by the following initiators: Petre Florin Manole (PSD), Adrian Dohotaru (independent), Oana Bîzgan-Gayral (independent), Iulian Bulai (USR), Marian-Gheorghe Cucşa (ALDE), Nicușor Dan (PNL), Laura Mihaela Fulgeanu Moagher (PSD), Cristian Ghica (USR), Cristian Ghinea (USR), Nicolae Georgescu (PSD), Laurențiu Dan Leoreanu (PNL), Adrian Mocanu (ALDE) Eugen Neaţă (PSD), Daniela Oteşanu (PSD), Adrian Claudiu Prisnel (USR), Florina Presadă (USR), Andrei Pop (PSD), Claudiu-Florin Roman (PNL), Adrian Solomon (PSD), Daniel Suciu (PSD), Răzvan-Ion Ursu (PSD), Daniel Vasile (minorities), Nicolae Velcea (PSD), Dan Vîlceanu (PNL), Sergiu Cosmin Vlad (USR). “Regulating informal settlements is a first step for the inclusion of informal communities and the chance for these citizens to enjoy equal rights and responsibilities. With employment security, access to infrastructure and services, the possibility of having a permanent identity document, they will be able to access public training programs, then to hire, pay taxes, and provide future generations with better living conditions and opportunities for a better future. The postponement of the establishment of a normative and operational framework for informal settlements does not solve the social and spatial problems they pose, but it emphasizes them. Security of tenure and adequate housing conditions underpin the whole process of social inclusion of these communities, which are now invisible to the Romanian state.” Bogdan Suditu, MKBT: Make Better, co-initiator of the No Man’s Land project. “This week we celebrate two years since the idea of ​​such a bill was born in consultations with one of the communities where informal housing is a real but legally unrecognized phenomenon. In such communities, living conditions are very harsh and no one can intervene – because they do not appear on official maps and their inhabitants are virtually invisible. They are part of a reality that, until now, was not legally recognizable. This bill is the key step in creating the framework for addressing the situation of informal settlements, together with public authorities and community members.” Gabriela Stanciu, Executive Director, PACT Foundation.